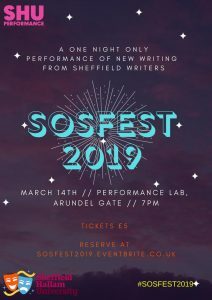 We were delighted to be invited to review the first ever SOS Fest 2019 (Sheffield Original Showcase) Festival, which aims to bring to life Sheffield born and based stage writing onto a semi-professional platform, performed by (mostly) Yorkshire born actors, and sent our guest reviewer (who writes under the name Artisan Friendly) along to review the showcase. “I absolutely love the idea of an open space that offers the opportunity for writers and performers to display their craft. Billed as a ‘one night only performance’, SOSFEST 2019, a showcase of original Sheffield writing, premiered this evening. The invention of producer/director, Melanie Hopkins, SOSFEST comprised of seven comedic and dramatic scenes and monologues. Just five weeks in the making and produced on a minimal budget of donations (via HallamGive), it was a fabulously entertaining vehicle which demonstrated the skill, talent and dedication of the performers and writers on board. Respect. Rather like a Woolworth’s pick and mix selection, the pieces and performances were various in subject matter and tone – covering those quite vast yummy differences between tempting truffles, soft centres, tricky toffees, chewy candies and sweet and sour sherbets. This enjoyable evening was interspersed throughout with gentle, unexpected and challenging humour and edgy, uncomfortable, dark subject matter. First up was ‘Toyshop’ in which two employees of a toy shop played out various bizarre customer interactions throughout the day, ending with them nicking the day’s takings. Next, the fourth wall was obliterated with a characterful and nuanced light and shade performance from Barry Worthington as a man with major misgivings over an impending knee operation (‘Mr Frobisher: You’re Fired’). The third piece ‘Footsteps’ at first appeared to be a ‘keep fit for misfits’ exercise class before turning into a bittersweet Mike Leigh ‘Secrets and Lies’ type scenario where a mother and her grown up adopted daughter meet for the first time and past regrets and sorrows begin to surface. Rebekah Austin and Daisy Frossard balanced the exchanges between the two parties nicely and indicated that their relationship boded well for the future as they headed off for a cup of coffee together. Before the interval, Janice Sampson both writer and performer of ‘Back in the Saddle’ delighted us with a deliciously witty performance as Rita, whose second husband, Malcolm ‘only had one testical’. We met her as she was ‘Back in the Saddle’ and about to hit the aisle for a third time. For me, this was one of the highlights of the evening. An insightful piece of writing bundled full of character with both tragic and warming humour. I hope it’s third time lucky, Rita! During the Interval, a fine collection of classic pop tracks accompanied the lively chatter including Sweet Dreams (are made of this) and Take a Chance on Me. The second act kicked off with the sparse set of ‘Dog Eat Dog’. What started out as a seemingly innocent date between Sophie and Johnathon turned into something truly horrifying. Enticed by Sophie to have a nightcap and then to be handcuffed to a chair, Johnathan soon finds himself trapped in a cat and mouse game where he has become a victim and his internal organs are about to be sold. Rebekah Austin and James Gucc stumped up the tension as the true significance of their date came to light with a shocking reveal. It was a date with death. Breaking the tension and following on nicely, the penultimate piece ‘On Stage with Shirley Bassey’, found David (Christy Fitzsimons) cradling his mother’s ashes and recalling how, although his mother loved Pontefract Cakes and Shirley Bassey, her love didn’t quite extend to him. It was a poignant piece of writing performed with some delicate pauses and beats as it alternated between humour and pathos. It ended nicely with David deciding to make his mother ashes into a diamond and present it to Shirley Bassey. And finally, the frivolously farcical ‘The New House’ where a group of ‘friends’ tricked a petrified hostess (a sumptuously snooty Melanie Hopkins) into believing a murder had taken place at her housewarming party. As guests variously flirted outrageously or pegged it, knives were drawn (by crusty old aunt Caroline) creating confusion and chaos somewhat reminiscent of the early 80’s US sitcom ‘Soap’. I particularly enjoyed the staging of the show as it flitted between lively monologues (written by Janice Sampson) and two/three handers (by Melanie Hopkins and Jordan Nash), culminating in the madcap spoof Agatha Christie Whodunit? which involved the whole cast. Likewise, I also appreciated the way each scene used minimal furnishings, props and lighting, suggesting a set and creating a definite possibility to take it on tour – next stop Edinburgh? The varied titles of the pieces triggered curiosity and activated imagination too! Just which subject areas were these dramatic jabs going to pierce? The various tropes such as ageing, health (and the NHS-related) humour of Victoria Wood (‘You’re Fired Mr Frobisher’), alongside Alan Bennett-style ‘Talking Heads’ style reflections and recollections (‘Back in the Saddle’) and tense, disturbing Quentin Tarantino/Dirty Pretty Things revelations (‘Dog Eat Dog’) kept the onlooker involved. Was there also a Jean Genet ‘The Maids’ reference? (‘Toy Shop’). So, massively well done on the artistic diversity scales then. The delivery of the actors seemed to pay homage to Anne Reid (Janice Sampson), Michael Palin (Christy Fitzsimons) and bits of The Full Monty (Barry Worthington). The commitment and passion that went into producing this event really shone through (well done, Melanie) and it deserved so much more support! For further information on SOS Fest 2019 visit https://sosfest2019.wixsite.com/findoutmore.